San Francisco–based Gensler and New York and Toronto-based Yabu Pushelberg have released renderings for the Fig + Pico development, the latest set of towers for Los Angeles’s rapidly transforming South Park neighborhood. New York-based real estate firm Lightstone Group is working on the latest scheme for the city’s entertainment district, which encompass a grouping of towers on a 1.22-acre site directly across from the Los Angeles Convention Center and rising on the same block as the Harley Ellis Devereaux-designed Circa project, which is made up of a pair of elliptical, 38-story residential towers containing 648 units. 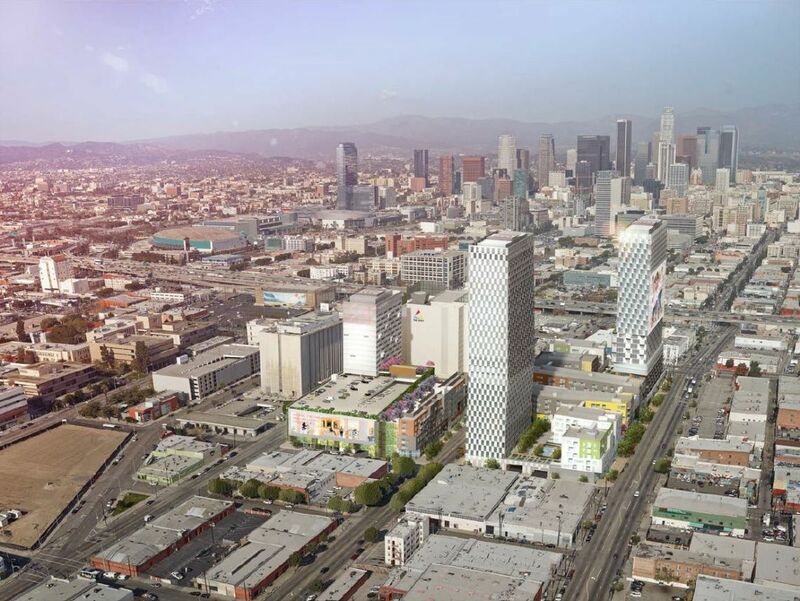 Urbanize.LA reports that according to an initial study released by the Department of City Planning, the Fig + Pico project would encompass trio of mixed-use hotel projects, with two of those hotels co-located within a 42-story tower containing a combined 820 rooms. The third hotel will be located in a 25-story tower adjacent to the tallest mass and will contain 342 rooms. Preliminary renderings contained within that report show a cluster of rectilinear, glass-clad monoliths sprouting from a mid-rise podium structure. All three towers are supported by slender, super-tall columns and are alternately oriented toward the south and west. The podium structure for the two taller masses has been designed to contain 11,000 square feet of ground floor retail spaces, as well as rooftop pool decks, conference areas, and a 353-stall parking structure while the third tower will contain 2,100 square feet of retail space among other programs. 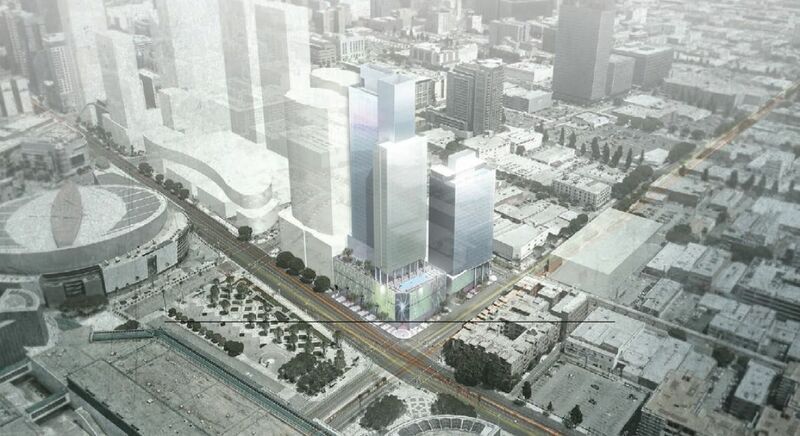 The project represents the latest addition to the city’s projected skyline, which according to proposed and currently-under-construction projects, will be steadily marching southward from the new AC Martin-designed Wilshire Grand tower toward Interstate 10 over the next few years. Just last week, Skidmore Owings & Merrill and P-A-T-T-E-R-N-S revealed designs for a crop of residential high-rise towers. 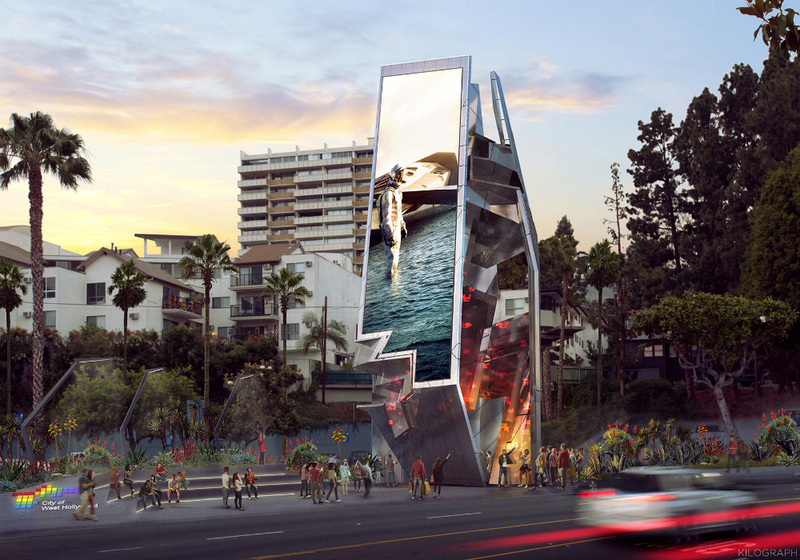 Like many of the adjacent residential and hotel projects, Fig + Pico is expected to have, per the developer’s request, illuminated signage along the retail podium levels for advertising and possibly, digital public art installations, as well. Pending city approval, the project is due to break ground in late 2017 or early 2018 and will be completed by 2022. Acting as design architect, developer, and general contractor, DDG developed a custom, cast-aluminum screen using 3-D modeling software and state-of-the-art hardware. A burlap texture was hand-applied to the set of 12 repeating components before the sand-cast molds were made and the finished components cast. 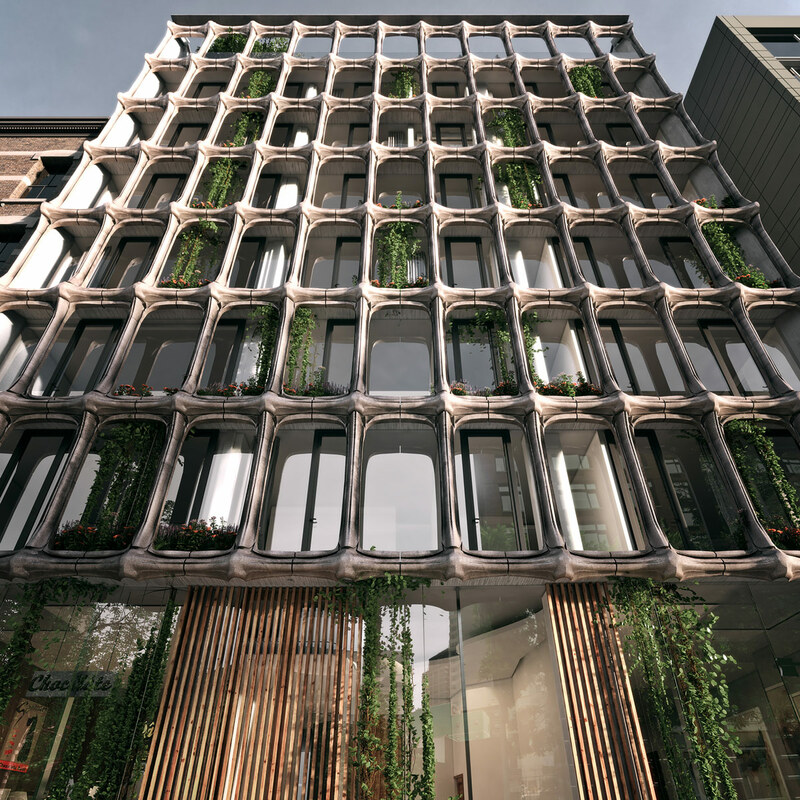 The resulting sinewy surface creates dialogue with the cast iron historic buildings of the area. The Interdisciplinary Science and Engineering Complex at Northeastern University is a high-performance research building with a triple-glazed curtain wall and solar veil to help the building exceed 2030 energy savings goals. Originally created as a one-time solution for Gensler’s Los Angeles office, the company recognized its wider possibilities and partnered with FilzFelt to produce a flexible modular panel system that adds texture and color to an environment while serving as a privacy screen, shade system, room divider, and acoustical element. Tribune Media Company, owners of the Los Angeles Times, is aiming to build a 30-story tower on an existing parking lot across the street from the historic L.A. Times building in Downtown Los Angeles. The project, first reported by Urbanize.LA, is designed by architecture firm Gensler and will feature 107 condominium units, 534,000 square feet of commercial space, and 7,200 square feet of ground-floor commercial area. 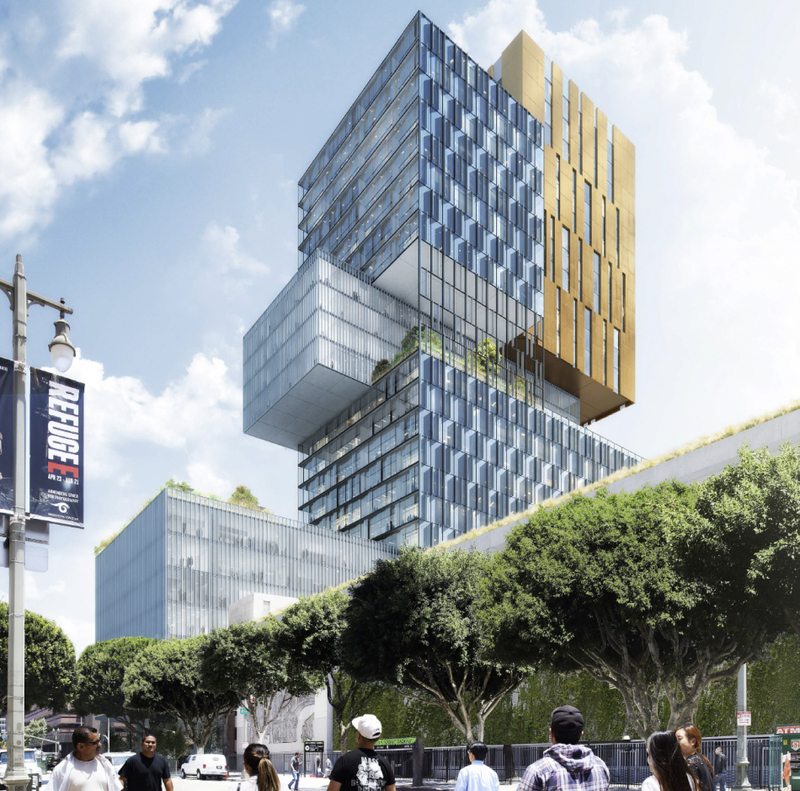 Located at the corner of 2nd Street and Broadway, the project, when completed, will also stand directly above a new underground subway station being built as part of the Los Angeles Metropolitan Transportation Authority’s (Metro) so-called Regional Connector project. The Regional Connector is an underground tunnel that will link together the existing Blue and Expo transit lines with Union Station and the Gold Line, fusing the Blue and Expo lines with the northern and southern halves of the Gold, respectively, creating two cross-regional transit lines that pass through the downtown area instead of merely coming to a dead end there as they currently do. A rendering for the project shows a highly-articulated tower with sections of grouped, projecting floorplates jutting out at various heights, along all sides. Each of the building’s boxy, projecting masses is clad in a different material and utilizes alternating stylistic approaches, with certain portions clad in floor-to-ceiling glass curtain walls and other sections featuring vertical ribbons of glazing spanning multiple floors. These masses overhang and project from one another, with other types of sun shading strategies like vertical and horizontal louvers populating the structure’s facades throughout. The development adds to speculation that a previously-mentioned plan to demolish a William Pereira–designed section of the existing L.A. Times building will begin to move forward, as well. That plan would demolish the 1970s-era structure for another housing tower, this one potentially containing apartments instead of condominiums. A construction timeline for either tower has not yet been released. The long, low-slung Milwaukee Post Office is not a popular building. The rust-covered Brutalist structure sits along a five-block stretch of the Menominee Riverfront, a place that, until recently, was generally seen as the undesirable backside of the city. But that is all quickly changing. Just east of the post office, the Third Ward neighborhood has been completely transformed in the last ten years. The Menominee River Valley to the west is also seeing new life after over 100 years of being the city’s industrial heart. Now, Chicago-based developers R2, in collaboration with Gensler, are betting on a brighter future for the much-maligned post office. When R2 bought the building and the surrounding land for $13 million in 2015, it knew it was going to be a long-term project. The United States Postal Service has a lease for its space through 2020, with the option to sign for up to 30 years. Even if the Postal Service were to vacate, the site would always have active train lines running under the building, between its massive concrete piloti. But that is not stopping R2 from planning ahead. 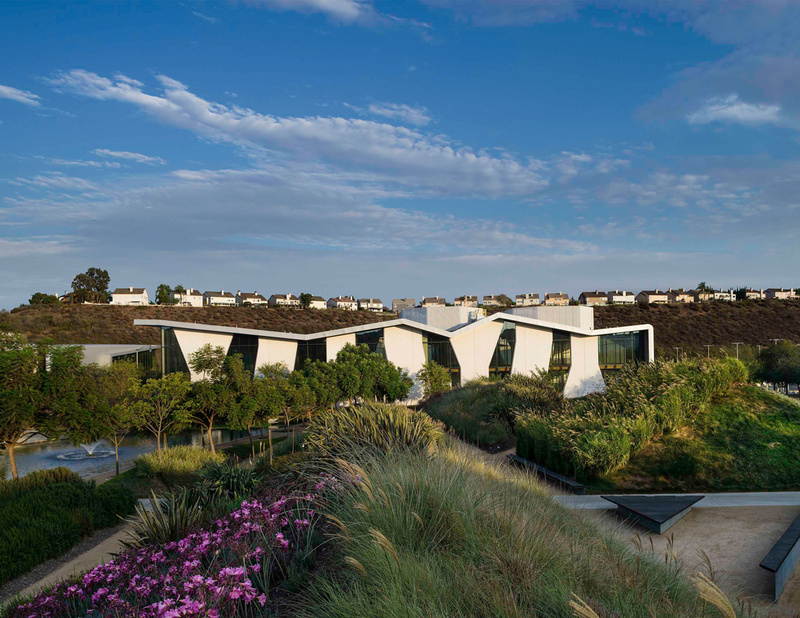 R2 and Gensler recently released new renderings and an outline of their plans for the site. 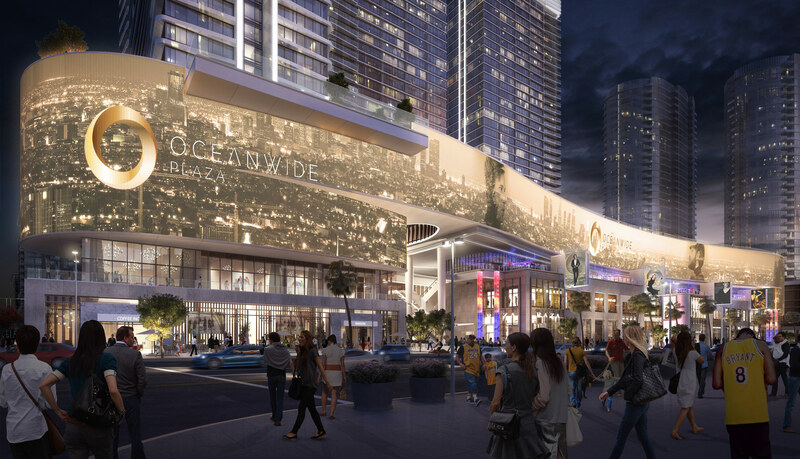 Gensler’s designs call for a major mixed-use development that incorporates office space, residential, and entertainment, as well as small and big-box retail. The site benefits from extensive access to transportation, including ramps from the adjacent elevated freeway, the Milwaukee Intermodal Station, the city’s main Amtrak and Greyhound station, and the now under-construction city streetcar. Along with renovating the current building, the project could include two large towers at each end of the site. The east tower would have 282,000 square feet of residential space, while the west tower (along with space in the existing building) would account for nearly one million square feet of office space. The 1,500 feet of riverfront would also be developed as a public promenade and an extension of the city’s growing Riverwalk. Restaurants will line the promenade, and kayak launches and boat docks will connect the project with river traffic. A foot bridge is proposed to connect the existing building to the James Biber–designed Harley Davidson Museum across the river. Though the Postal Service will remain a tenant in the building for at least the next few years, Gensler’s plans are such that, if given the go-ahead, the project could begin. By working in the currently open land around the building, much of the proposal could be realized without disrupting normal operations. If realized, the post office project will be one of many changing the face of downtown Milwaukee. 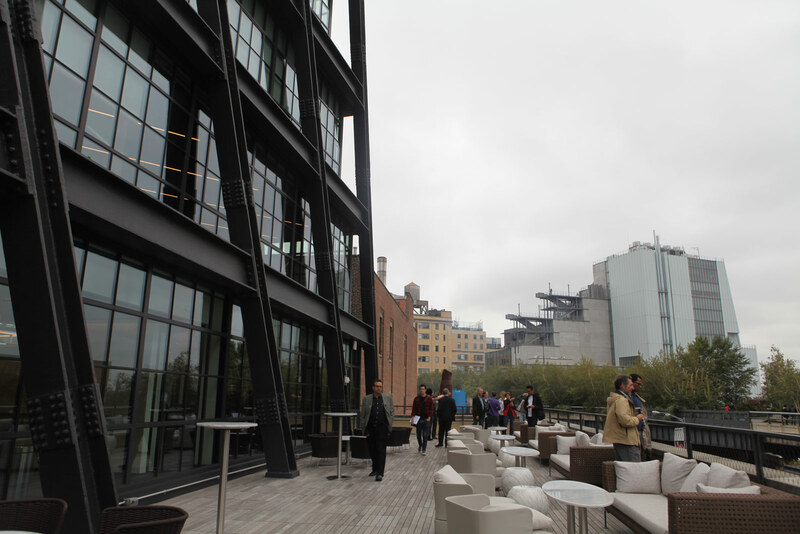 Of those projects rising just north of the site, few are as ambitious in scale or program. Yet with at least three years to go before the site could be completely free of its current tenant, the city is going to have to wait a bit for delivery. Though digital modeling and documentation tools have been an integral part of architectural practice for decades, until recently, visualization tools hewed closely to traditional elements of two-dimensional representation. Several firms and independent practitioners, however, are striving to adopt virtual reality (VR) as a design tool. At the corporate level, established firms like Gensler and NBBJ are setting up in-house VR departments and standing to benefit from their corporate heft and connections. Gensler’s Los Angeles office has taken the opposite approach, creating a virtual reality department that engages with existing VR technologies, looping the latest design tools into Gensler’s corporate workflow as they come online. Gensler’s San Francisco office utilized VR to create a highly detailed climate model as it designed a new headquarters for computer graphics card maker Nvidia. Alan Robles, experience designer in charge of VR technologies at Gensler’s L.A. office, described the firm’s efforts as an attempt to streamline the use of VR as a design tool, calling VR the “next logical evolution for rendering technologies.” Gensler integrates VR into its workflow early in the conceptual diagram stage while also pairing Unity software with Autodesk Revit later in the process to bring designers and clients directly into a working digital model where design options can be updated in real time. The firm’s VR capabilities are also being utilized in the ongoing design of the new Los Angeles Football Club stadium in South Los Angeles, where Gensler’s team was able to integrate VR design approaches early into the design process to communicate possible sponsorship opportunities and overall project concept. VR is incorporated into the conceptual design phases, making Gensler’s approach toward VR basically one of normalizing the technology as a design tool. The evolution of project concepts in VR takes off from there, with the technology being deployed as necessary to convey design intent. These efforts result in a custom app made by Gensler’s in-house team that clients can use as a personalized marketing and development tool. 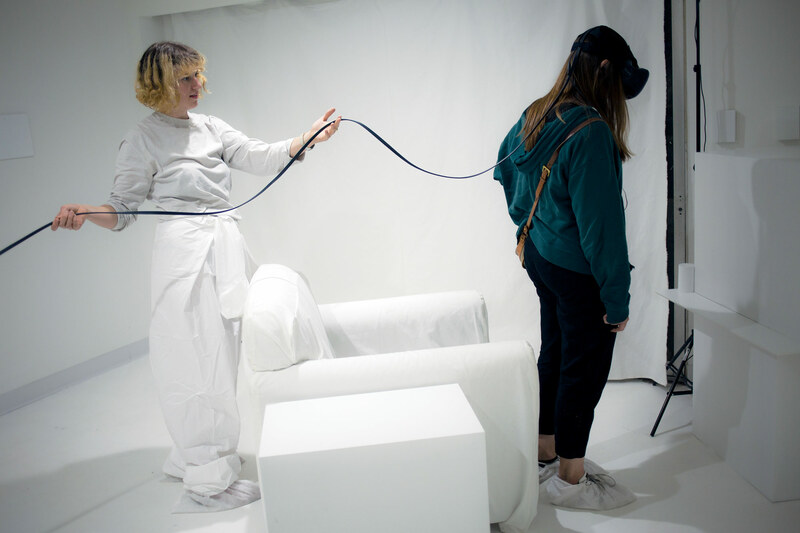 Operating in a parallel stream, a school of emerging designers has taken up VR as a key visualization and production tool. Güvenç Özel, principal at Özel Office, made use of VR in a recent competition proposal made for NASA. His NASA 3D-Printed Habitat project, runner-up in the competition, creates a VR environment to convey its design intention and functionality. The project, showcased at the Architecture and Design Museum’s recent exhibition, Come In! DTLA, allowed observers to wear VR headsets to explore the scheme: A space capsule 3-D-printed from martian rock and occupied as an operating base for astronaut-explorer scientists. Özel, who spoke to AN via email, described VR’s potential impact on architecture in no uncertain terms, saying, “The immersiveness of these digital environments are becoming so convincing that they start to exist as environments in their own right. I am convinced that the architecture of our near future involves physical and digital spaces superimposed on each other, and will further blur the lines between what is interface design and what is architectural design.” Designer Devin Gharakhanian, in collaboration with VR specialist Nels Long, presented Room XYZ at this year’s One-NightStand L.A. showcase, utilizing VR to recontextualize an all-white room into a variety of experiences. The project, in a different iteration, places the viewer into a precise, virtual recreation of an elaborately staged room. For the two architecturally-trained artists, the works serve to explore existential architectural issues directly. Adding to this inertia, is a growing stock of interdisciplinary, VR-focused coworking spaces and organizations that are coalescing across L.A., where the edges of the visualization, filmmaking, and architectural professions run into one another, like Virtual Reality Los Angeles, Navel.la, and RotoLab. With the recent announcement by computing giant Intel of a new collaboration with Microsoft aimed at developing VR capabilities for Windows-based machines and plans to open an L.A. research studio, the future of VR is here—and it’s very real.